As stated in the previous edition of the National Brief, AMFA is unique and there are various roles in our Association that work together to ensure that you receive the best representation possible. In the last issue, we discussed the Administrative role-more specifically the Local Executive Council (LEC). In this issue, we explore the contractual role in our Association and how that is accomplished. The AMFA Constitution and your Local Bylaws specify the apparatus that deals with the enforcement of the contract between AMFA and your carrier, otherwise called the grievance procedure. At the floor level is the Shop Representative, elected by members of that specific bid location and shift. The Shop Representative's job is to file grievances on a member's behalf, represent members in fact-finding meetings, and provide contractual updates as necessary. This is one of the most important jobs in AMFA, as this is the position most often associated with our union. These representatives are the front-line soldiers in our collective fight to enforce the contract. Recently, the Association completed an updated and interactive Shop Representative training program that has been positively received by those who attended. If the Shop Representative is not able to achieve success with the grievance at the local level, or if they need additional help, they may turn to an Area Representative, a position identified in the Constitution that an LEC can utilize to "serve the outlying station membership of that local." This is a position that overlaps the administrative and contractual functions of the Association. The Area Representative falls under the jurisdiction of the LEC, but receives instructions and duties from the Local Airline Representative, a position discussed later in this article. The Area Representative is elected for two years by the contract-specific members that they serve and has several duties such as: handling grievances, helping with contractual interpretations, helping compile contract proposals for their LEC, being informed on negotiations, and maintaining close contact with the Shop Representatives and LEC. Some locals use Area Representatives extensively, while others do not. It is entirely up to the LEC to determine if the local needs the expanded representation that the Area Representative can provide. As mentioned above, the Shop Representative and Area Representative take instruction from the Local Airline Representative. Each airline in a local must have at least one, and the number of Airline Representatives is determined by the amount of carrier-specific members at that local. As a local officer, but not a member of the LEC, they are elected for two year terms by the carrier-specific membership. This individual is responsible for many important duties. Topping the list is the responsibility of negotiating, interpreting, and enforcing your contract. The Airline Representative is your local's member on the system-wide negotiating committee during contract negotiations. He represents his member's interests and points of view to the union negotiating committee during caucus as they advance the member submitted proposals and deliberate the direction they want to follow in response to a company proposal. They are there throughout negotiations as each side's proposals are presented, argued, and resolved. Through this process they are an essential part of creating the "bargaining history" that plays an all important role during contract enforcement. After negotiations conclude with a new contract, in future grievances and arbitrations over negotiated contract language, an arbitrator will seek to understand the bargaining history that went into drafting the contract language being argued as well as the intent behind the written word. Therefore, the Airlines Representative as a participant and eye witness in negotiations plays a vital role in explaining to the arbitrator the union's intent behind every word negotiated into the contract. Additionally, the Airline Representatives decide which unresolved grievances go forward to arbitration. Once the Airline Representatives decide they want to take a grievance to arbitration they get an opinion from AMFA legal and present the case to their respective local's LEC for notification and review. This process works to provide a check and balance for those cases that are being considered for funding for arbitration. As you can see from our previous article on the administrative side of the Association, coupled with this article on the contractual side of the Association, it takes a lot of dedicated people working hard in their roles to provide the union representation that you as a member should expect and deserve. In the next edition of the National Brief, we'll tackle the safety representatives and their role in our Association. Have you tried the new Smartphone App? 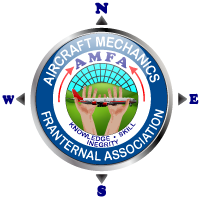 The Aircraft Mechanics Fraternal Association (AMFA) has created a smartphone app for its members. 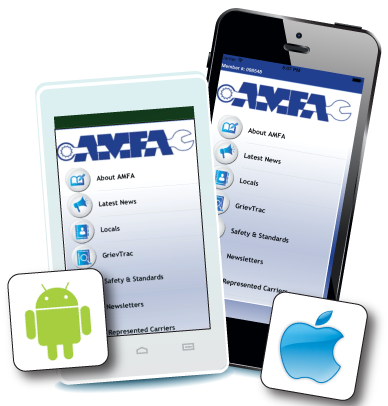 Available for both Android and Apple phones, the app is a quick link to the latest news and information from your Union. With built in GrievTrac access, the app gives our contract representatives private access to file grievances on behalf of our members. "Safety in the Air Begins with Quality Maintenance on the Ground"